Lilligant, the Flowering pokémon. 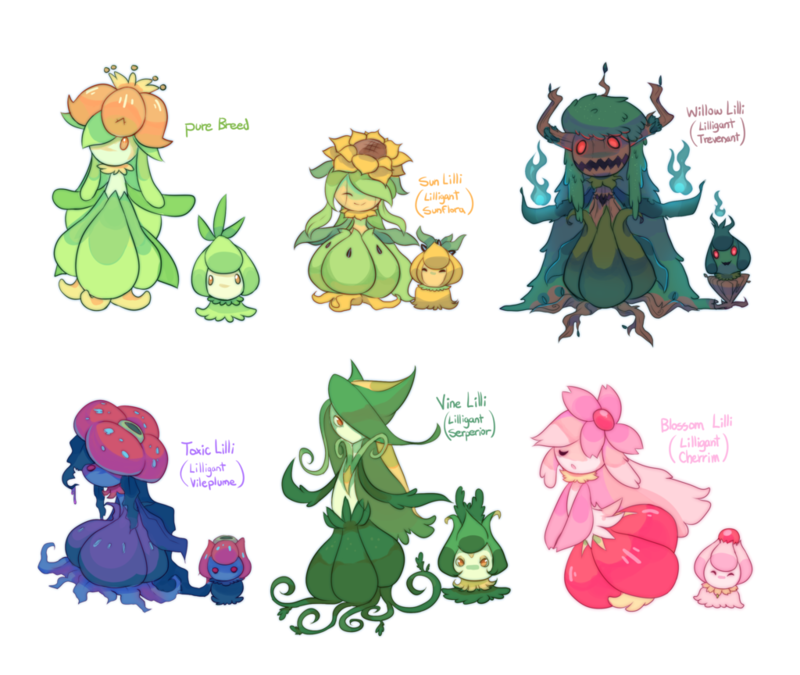 Lilligant is a 3′ 7″ Grass-type, with the common abilities Chlorophyll or Own Tempo, or the hidden ability Leaf Guard. 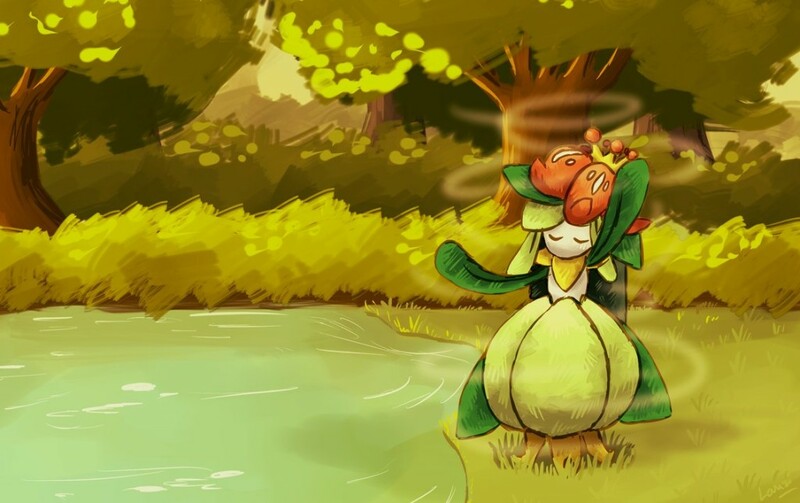 Being a Grass-type, it has a natural weakness to Flying-types, Fire-types, Ice-types, Poison-types, and Bug-types, but a strength against Water-types, Rock-types, and Ground-types. It’s tough being a Grass-type, especially a Grass-type with such weak stats as Lilligant’s. However, Lilligant’s beauty and charm has won her a special place in my heart in the form the Most Elegant PKMN*. Behold, the elegant uselessness of Lilligant. 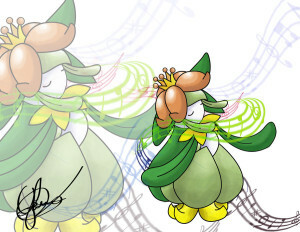 Lilligant is fairly strong, but for the most part I would call it a “one-hit-wonder”, as with a base Special Attack stat of 110, but only a base Health stat of 70, you can only use her to get in about one hit when it comes to battling real trainers (rather than NPCs like Gym Leaders) before she gets totally creamed. 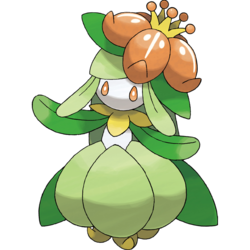 In case you haven’t noticed yet, I keep referring to Lilligant as a girl. That is because, much like Jinx, only female Petilil and Lilligant exist. I think that one look at this little flower’s design can easily explain why. But, if you’re a fan of breeding, fear not. I only learned this myself recently, but pokémon with similar anatomy can bred together, such as being able to breed an Arcanine with a Donphan. The pokémon you get will always be the first evolution of the mother. For example, let’s assume your Arcanine was a girl, and your Donphan was a boy, the result would be a Lv. 1 Growlithe. So, Lilligant would be able to breed with pokémon like Bisharp. Unfortunately, breeding two different kinds of pokémon does not change the resulting ‘mon’s physical appearance like in the picture here. But, what if it did? What if breeding a Cherrim with a Lilligant resulted in a Blossom Lilli, like in the bottom right of the picture here? What if breeding a Misdreavus with a Gardevoir led to a Ralts with Misdreavus’ color pattern and a the ability to use the Ghost-type version of Curse? What if breeding a Flareon with an Ampharous gave you a Mareep with wool colored like Flareon’s mane and a red orb on it’s tail? The possibilities are near endless. Now, Lilligant may be weak, but she isn’t without her uses. Like I said, she can pack a pretty good first punch, or if you set up her defenses right, she can be a very good status monkey. With moves like Toxic, Sunny Day, Safeguard, and Attract, she can keep you safe and help your other pokémon take down your opponent’s in a multi-battle of any kind. 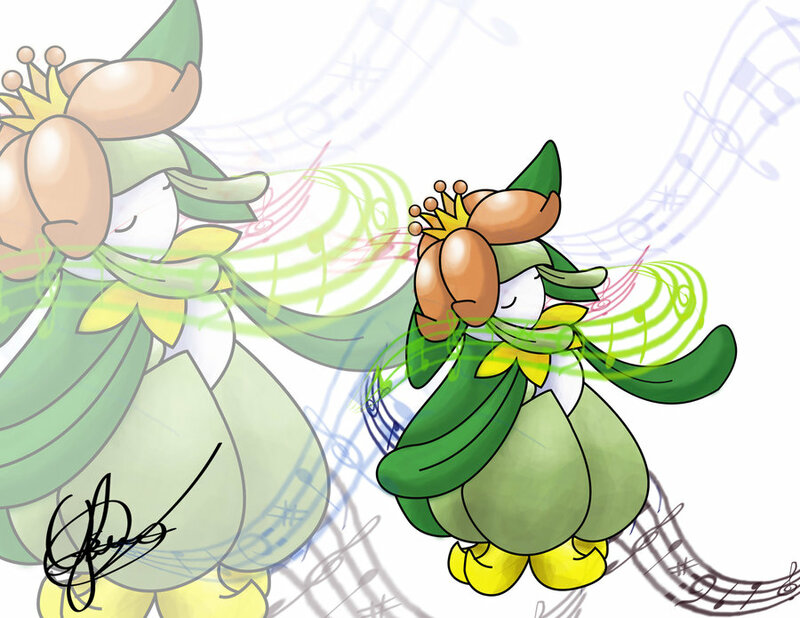 Of course, Lilligant is also a show-stopping, stage-loving dance machine. Back in generation five, a.k.a. Pokémon Black, White, Black2, and White2, one of the minigames was the Pokémon Musical. One could dress up their ‘mon, give them special items that can effect their appeal, and then let them perform in one of four musicals. Depending on what items you give it, and when you use your special appeal items, you can unlock more accessories to use in more performances. You can use any pokémon you want in these performances, but ‘mon like Lilligant who can hold special appeal items and wear a variety of other accessories do best. Then there’s Pokéstar Studios in Black2 and White2. Pokéstar Studios is a place where you can go and make movies; what you star in depends on what script you select. The first time you perform in them, you are required to use the pokémon the studio supplies, but you can choose to redo them using pokémon of your own if you wish. 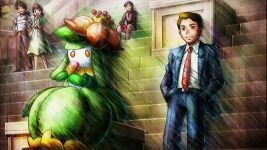 With this in mind, Lilligant can play roles from the weak, helpless damsel to the strong, defiant heroine. Like everything else, it all depends on the role you cast her in. So, what do I think of Lilligant? From a theatrical, aesthetic view, she’s amazing. From a battling view, she is far from the best. But, as I’ve said in the past, that doesn’t really matter to me. I’m still going to love her, even if she’s easy to knock out. Fair well everyone, and merry Pokémonth! *PKMN, common short hand for pokémon.